How to Link Aadhaar Card with Vodafone Mobile Number at Home through IVRS Call System? 1.3 How to Link Aadhaar with Vodafone Mobile Number Offline? 1.4 How to Link Aadhaar with Vodafone Mobile Number Online? NEW UPDATE: Last Date to Link Aadhaar with Vodafone Mobile Number is extended to 31st March 2018 and New Method “Re-verification through Call & OTP SMS” is Live Now! The government has announced new method to Re-verify any Operator SIM and Link Aadhar Card with Mobile Number from Home through OTP or Call System i.e., Online Method. Isn’t it a Good News? Well, the method started working and the guide on how to do it is added below. You must have received an SMS or Call from Vodafone asking to Re-verify your Mobile Number through Aadhaar based Biometric Verification. As per Government, All the Customers or any Operators in India have to re-verify their Connection through Aadhaar Card Biometric Verification. This is also known as Re-verification of Existing Connection or Customer. This is must for all the Customers to keep their Connection or Operator Services Active. As per now, the Last Date to Link Aadhar with Mobile Number is 6th February 2018. We already have published Guides on How to Link Aadhar with any Mobile Number? Or How to Register Aadhaar with Mobile Number? You can refer them if you want to Link Aadhaar with any other mobile number. Step – 1: First of all, Open Phone Dialer and Call to the given IVRS number from the Vodafone Mobile Number which you want to Re-verify. Step – 3: Now just listen to the Disclaimer and then Press 1 when asked: “if you have Aadhaar Number or not?”. Step – 4: Wait for a Beep and then enter your 12 Digit Aadhaar Card Number through Dailer Pad. And then Press 1 again to confirm the entered Aadhaar Card Number. Step – 5: Your Aadhaar Card Registered Mobile Number will receive an SMS containing OTP of 6 Digits. Just check the OTP and enter the OTP on the Call itself through Dialer Pad. Step – 6: Again Press 1 to Confirm the Entered OTP. Upon successful OTP Verification, the Vodafone Re-verification Process completes. This is it. You will soon receive Confirmation SMS on the Status of your Aadhaar Card Mobile Number Linking. How to Link Aadhaar with Vodafone Mobile Number Offline? Here are the Easiest Steps to Link Aadhar with Vodafone Mobile Number Offline by Visiting Nearest Vodafone Store or Retailer. Step – 1: First of all, Visit the Nearest Vodafone Store, Mini Store or Retailers Shop where Vodafone Aadhar Link is done. Do carry your Aadhaar Card Number, your Mobile Number which is to be Re-verified and the Person whose Aadhaar Card is used (for Fingerprint Verification). Step – 2: Now give your Vodafone Mobile Number to the Agent or Retailer of Vodafone along with the Aadhaar Card Number. Step – 3: Once the Agent or Retailer start the Vodafone Aadhar Link Process, you will receive the One Time Password (OTP) on your Vodafone Mobile Number which you are Re-verifying. Just submit the OTP to the Retailer/Agent. Step – 4: Now Put your Finger on the Biometric Device or Fingerprint Scanner. The Person whose Aadhaar Card is linked has to do the Fingerprint Verification. So put the finger of that person for Biometric Verification. Step – 6: That’s it. You will receive the Confirmation SMS on your Mobile Number within 24 hours. You can reply to that SMS with “Y” to confirm the Vodafone Adhar Link Process. Done. Vodafone Aadhar Link Offline Process or Re-verification is Completed. Now your Vodafone Mobile Number can be used without any risk of Service Discontinuation. Follow Here: How to Link Aadhaar Card with Idea Mobile Number Online & Offline? 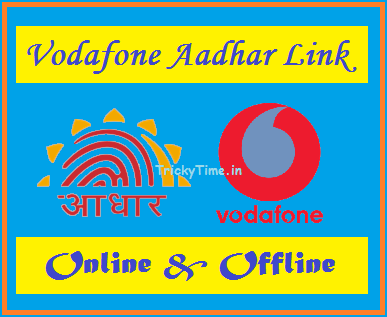 How to Link Aadhaar with Vodafone Mobile Number Online? First of All, Let me clear one thing. Yes, you can do Vodafone Aadhar Link Online. It’s possible but only for the Verified Retailers or Agents. You can too become the Retailer or Agent temporarily to do the Re-verification process if you wish not to do it offline. This will require few more things, including a Biometric Device or Fingerprint Scanner which may cost you few bucks. You will also need an Agent Account or Retailers Verified Account for which you will have to Apply, maybe by visiting the Vodafone Store or Calling Customer Support and through App also it’s possible (which may take few days). If you are an Individual, then I will recommend you to visit the Offline Retailer or Store for doing Vodafone Aadhaar Re-Verification to avoid additional costs. Still, if you still wish to do Vodafone Adhar Link Online then check the full requirements and steps below. Here are the things required to proceed with Online Vodafone Re-Verification or Vodafone Aaadhar Activation Online. If you are a Retailer or managing Store then this Guide will help you to help your Customers link their Aadhaar Card with Vodafone Mobile Number. Vodafone also offers Rs 5 or more for each Re-Verification done by you. So you can also earn for helping your Customers link Aadhar with Mobile Number. Agents and Retailers have the capability to do the Vodafone Aaadhar Activation Online and can do the Vodafone Aadhar Link of their Customers. So if you don’t have the Agent or Retailers Account then you need to Apply for it. How to Apply for Vodafone Agent or Retailer Account? Visiting the Local Vodafone Store: You can Visit the Vodafone Store and Request for the Agent or Retailers Account. They may ask some Proofs of your Shop or the Reason why you need. Just submit the things they asked and you will get the Retailers or Agent Account using which you will be able to Link Aadhar Card with Vodafone Mobile Number. Using Vodafone Connect App: Download Vodafone Connect App and you will see the option to Apply for Retailer or Agent account. Click on “Want to become retailer” option & just fill out the asked details and one of the Vodafone Executives will call you and help you get the account. This is the Basic Requirement of Doing Vodafone Re-verification online. Some Dealers or Vodafone Executives offers such Devices for Free to their Agents or Retailers since they Help Customers in Re-Verification. But the chances are less. Still, you may ask Vodafone Executives to Get you One Fingerprint Scanner or Biometric Device. For Vodafone Adhar Link Online, you must have an Android Smartphone with Android Version KitKat (v4.0) or Above. If you don’t have it, then arrange for it. Because the App we will use for Online Aadhaar Mobile Verification will be Supported in Such Android Phone and the Fingerprint Scanner will be Supported in Android Smartphone with KitKat or Above Version. 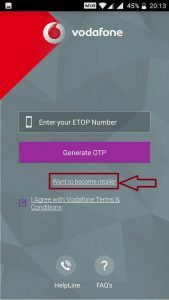 Step – 2: Now Enter your Vodafone ETOP Number (Retailer Account Number) and Verify it through OTP. Step – 3: After Successful Login, you have to add Agent. You can add yourself or any other Agent in the Vodafone Connect App. Enter Agent Aadhaar Card Number and do the Fingerprint Scan using the Biometric Device to Add the Agent Successfully. Note: Connect the Biometric Device you have with the Android Phone you are using to do Online Aadhar Mobile Link. You will also need to Download the App for your Fingerprint Scanner in order to read the fingerprints on your Phone. The installation process will be available in the Fingerprint Scanner Owner’s Manual. Step – 4: Once you add the Agent, you are ready to do Vodafone Aadhaar Link Online. Now click on Update Vodafone KYC Option. Step – 5: Enter the Vodafone Mobile Number which is to be Re-verified or to which the Aadhaar Card is to be linked. Step – 6: Enter the OTP Received on the Vodafone Number which is undergoing Vodafone Aadhar Link Online Process. Step – 7: Now you have to Enter the Aadhaar Number of the Retailer. If you are the Retailer, then enter your Aadhaar Number and do the Biometric Fingerprint Scan to Verify your Identity. Step – 8: On next step, Enter the Aadhaar Number of the Subscriber whose Vodafone Number verification is going on. Step – 9: Confirm or Modify the Details loaded from Aadhaar Number and ask the Subscribe to do the Fingerprint Scan in Biometric Device. Step – 10: That’s it. Once the Verification is Completed, Vodafone Aadhar Online Verification is Successful. 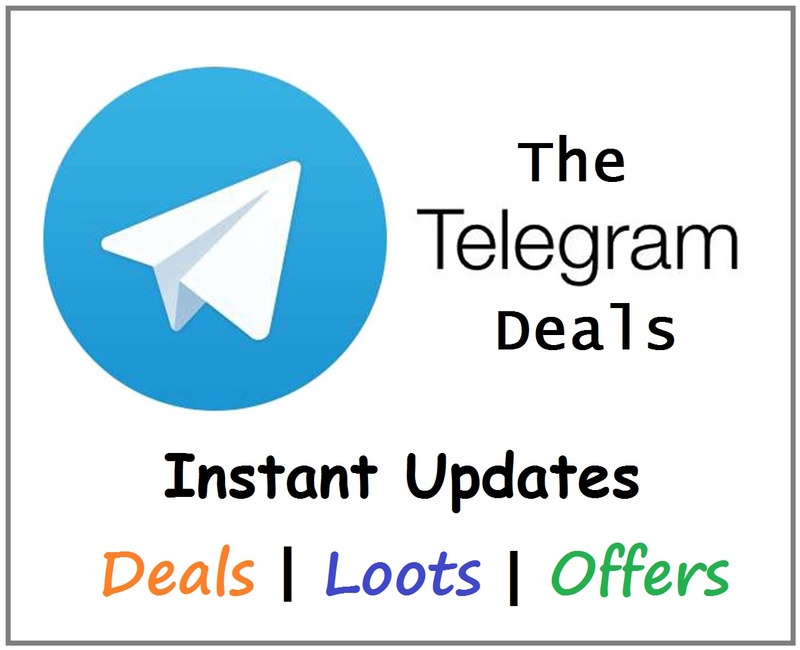 The Subscriber will receive the Confirmation SMS within 24 hours. CHECK HERE: How to Change Address on Your Aadhaar Card Online? What if I don’t Link Aadhaar With Vodafone Mobile Number? Before the Deadline of Aadhaar Mobile Link, if you don’t do the Vodafone Aadhaar Based Re-Verification then your Services will be stopped and you won’t be able to use your Vodafone Number anymore. So don’t take this step lightly, it’s compulsory for every Customer. What is the Last Date to Link Aadhaar with Vodafone Number? The Last Date to Link Aadhar Card with Vodafone Mobile Number is extended to 31st March 2018. Is it Possible to Link Aadhaar Card with Vodafone Mobile Number Online? Do I have to get any other documents along with my Aadhaar number to complete the re-verification? Not necessary and not even required anyway. You just need to come in person with your Aadhaar number and your active sim card or connection to complete the E-KYC Based (Aadhaar based) re-verification. It’s too easy and 5 min process. What if I am Outstation now, How can I link my Aadhaar with Vodafone Mobile Number? Currently, there’s no official announcement from Vodafone nor from Government in this regard. So stay tuned and wait for the Confirmation. I stay in Delhi but I am in Gujarat right now. Can I re-verify my connection in Gujarat? Sorry, it’s not possible currently. No Telecom Operator will be able re-verify your account if you are in another location. The re-verification can be done only in the same circle in which your connection was bought. And as per now, there is no official notification or information from Government too. This will depend on your Area and Operator. 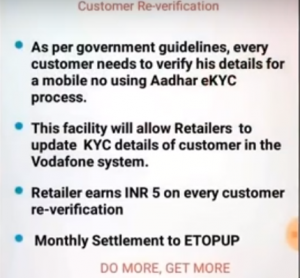 Currently, Vodafone is Offering INR 5 per Re-verification to every Retailer. Are there any fees for Linking Aadhaar Card to Vodafone Mobile Number? Ans: No, it’s absolutely free. If someone asks for money or charges you then simply complain to Customer Care about it. why otp based ekyc not started for these networks? any idea…. There seems delay with OTP or SMS Method implementation for all the Operators. It is expected to start from January 2018. Stay tuned for further updates. What is the obtain if biometric or fingerprint has not done can we do online link aadhar to Vodafone mobile without doing biometric? 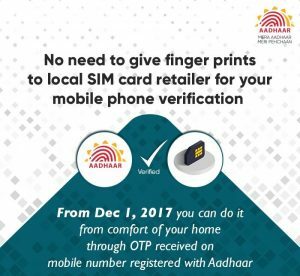 Yes, you can now do it through OTP or SMS which doesn’t require Biometric Verification and also you can do this right from your place i.e., Home or Residence. The full details guide on it will be up soon.